For our spring issue of Preservation, I spoke with Grammy-winning singer and businesswoman Gloria Estefan. The new National Trust for Historic Preservation board member had so much to say about her love for preserving historic places, we weren’t able to fit it all on one page in the magazine, so we’ve included an expanded version of our interview here. Enjoy! You joined the National Trust’s Board of Trustees in October. Why is historic preservation something that you feel passionate about? There are many reasons. I came to the U.S. when I was 18 months old and we, the Cuban community, in essence, have tried to transplant our culture here in Miami, everyone thought originally that we would be going back. At least our parents did. And as we grew and became part of the city, it was important for Emilio [her husband] and I both, to be a part of its growth in the business community and culturally as well. So through our music and our restaurants that we do we’ve tried to extend our Cuban culture that way and tried to preserve it. I always used to come to the beach with my grandfather, every day practically, because we loved it. So when we first made some money I told Emilio I thought that it was important for us to invest in Miami Beach because I thought that you can’t recreate that Art Deco jewel that we have there. So we started buying different properties on Miami Beach. The first building that we bought was an old apartment building from the ‘30s; we restored that. We bought the Cardozo Hotel; we restored that. We bought a building in Lincoln Road; they had really done a number on that building, it was from 1929 or something like that if I remember correctly, and we restored it. We put back the balcony, we put back the courtyard -- everything that was there, we put it back to its original place. We had pictures of the whole thing and actually some plans too. To have this opportunity to be invited to be on the board is really a wonderful thing for me. It’s right up my alley, especially now that we’re trying to preserve another jewel in Miami, the Miami Marine Stadium, where we actually performed at one point. It’s probably the only building of its kind that has that expansive concrete roof. So we’re now working to try and restore that site. 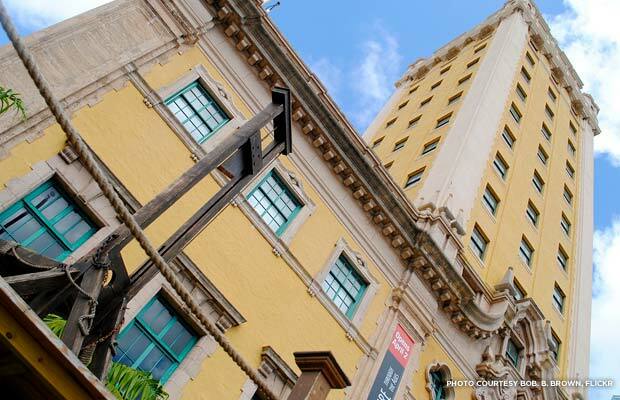 We’re committed to that because it’s part of our history, our personal history, the history of Miami. I think it can be a spectacular place to do even classical concerts because it’s right there on the water and the acoustics and everything would be so perfect for that, and I think it’s a shame [that it’s not being used.] We have this amazing thing that not only is a part of the culture of Miami but also part of my own Cuban culture. What do you think it is about historic places that make them so powerful? I’m a big believer in energy and I think when you leave a place, things that have happened in places are engrained spiritually and energy-wise in that place. You can’t really move forward into the future if you don’t understand and know the past. And there are certain things that have been able to stand the test of time. And I think as human beings it gives us a sense of connection, of roots, of being able to point to something and look at it and show our children and teach them. Some historic places have some pain involved because most human life does, but the fact that it has survived is a nice metaphor for humanity in general. Do you have a favorite historic place? I just really enjoy being in places that have a history, that have that connection with the past that can teach us things. I don’t have a favorite, but I do enjoy every historic place I’ve ever visited, not only in the United States but in the world. We’ve been blessed to be able to have our children travel with us and see historic places all over the world. For example, when my son was on tour with me I made sure he did his schoolwork with a tutor for a couple hours, then I’d make sure we would go to some historic place in each city that we visited so that he would take with him a sense of where the culture had come from, what had happened. I just think it enriches our lives and it’s definitely something that’s important to carry on to our kids. I enjoy going to as many as I can. They’re all incredible, they all have something to offer. We were just in Paul Revere’s house in Boston with my daughter, and it was amazing just to walk through those same rooms where Paul Revere lived and what an amazing history he had. And the fact that you can still visit? It just adds a lot to life in general. What was it about the specific historic properties you’ve bought and restored in Miami that drew you to them? 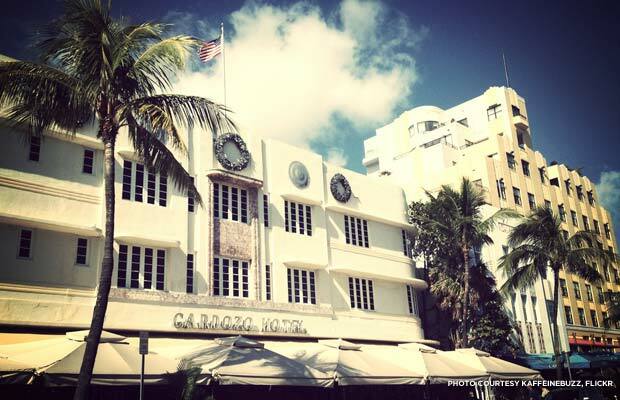 And I love Art Deco, I love the look of it, it’s one of the connections that we have in Miami that we can offer the world. Look what it did for tourism in South Beach. It’s just a great draw for tourism, something for them to do and see and enjoy that has to do with the history of the place and not just the sun, the fun, and the beach which we’re very famous for. Would you say there are certain places that you can think of that have been especially well preserved? Are there places that you believe deserve more attention? We’re stepping up. For example, the Freedom Tower here in Miami that was a big part of the Cuban history, I remember going there with my grandfather to pick up big boxes of cheese and canned meat to help out the family because we had nothing at that time. I think they’ve done a great job with that. I think there’s a lot more we can do. I think that establishing something along the lines of what they’ve done with like the Holocaust Museum where you actually have an experience where you go through it. There’s many a story that can be told of the people that went through. I would love to see that kind of thing for the kids because everything’s becoming interactive and there are so many possibilities. So there’s always something to do, even in the places that have been preserved well. You can always move into the future with new ways to engage our children. What are you currently working on? What do you have coming up? I’m actually working on an American standards record, which falls right in line with this stuff because to me music [needs] that kind of cultural preservation, as well. It’s very close to my heart. We are trying to do something unique but [also] trying to stay true to the style and the spirit of these songs that have stood the test of time. They’re songs that don’t go away and never will because they touch people regardless of the fact that they were created many decades ago. Sounds pretty similar to historic places. It’s a big honor for me to be a part of this and I’m very excited about being able to really help out in my local area with the things we’re doing here but also on the national level in any way that I can be of service.